I'm Carly Howett, a senior research scientist at the Southwest Research Institute in Boulder, Colorado. I've been working on NASA's New Horizons mission since 2012, focusing on an instrument named Ralph, which among other things provides the color "eyes" for the spacecraft. When I started looking at Ralph images of Pluto and its largest moon, Charon, back in 2012, the bodies were so far away they appeared as just a speck of light, too close together to see separately. So you can imagine how excited I was to see Pluto and Charon not only as separate worlds this year, but with clear and different features across them. It is these differences, specifically across Charon, which have since been the focus of my work. Surfaces vary in color when something about them changes; this difference could be due to composition (what the surface is made of) or physical state (changes between solid and liquid, or changes in their structure – for example at high-pressure carbon changes from graphite to diamond). We see this every day on Earth. For example, water looks different compared to sand and they both look different than ice. Another example of these differences is that carbon forms both the dark-colored graphite we use in pencils and clear sparkly diamonds. Looking at Charon, it's very clear that the northern polar region is much redder than the rest of the moon. But what's causing this color difference and why does it occur at the pole? 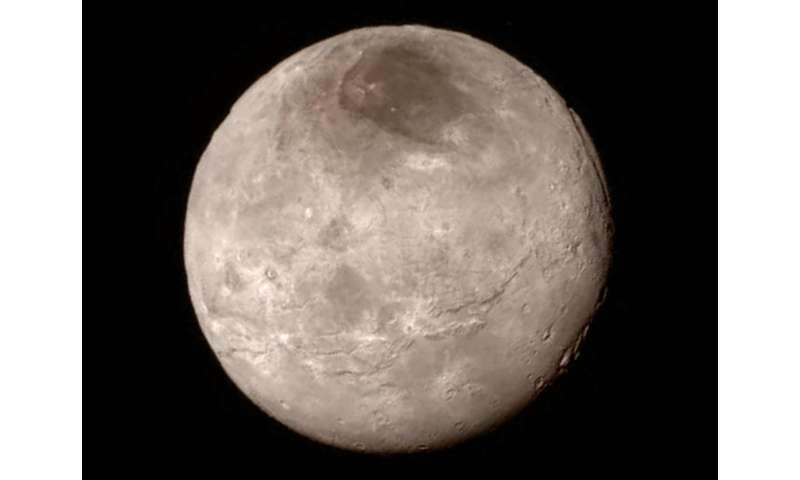 To answer the first part of this question we consider what we know about Charon. We know that Charon's surface is too cold for anything other than solids to exist, and the surface isn't subject to extreme changes in temperature and/or pressure, so it is unlikely significant phase transitions are occurring. Instead, we think that the color variation is due to a change in surface composition, which leads to the conclusion that the surface of Charon's northern polar region is made up of different material than the rest of Charon. One theory is that small amounts of Pluto's atmosphere can escape and eventually reach Charon, where it would be temporarily trapped by Charon's gravity before escaping to space. Charon's polar regions are very cold, and I mean VERY cold! In fact, over the course of Charon's year the polar temperature varies somewhere between -433 and -351 °F (-258 and -213 °C), which is only tens of degrees warmer than absolute zero. These temperatures (especially with Charon's extremely thin atmosphere) are too cold to support surface liquid: gases are deposited straight to solids, and solids sublimate directly to gases. So—unlike at Charon's warmer equator—any gases that arrive on the winter pole would freeze solid instead of escaping, a process scientists refer to as "cold trapping." The basic principle that binary systems can share material is not new, but it took New Horizons to visit Charon to see its effect firsthand! We know Pluto's atmosphere is mainly nitrogen, with some methane and carbon monoxide, so we expect that these same constituents are slowly coating Charon's winter pole. The frozen ices would sublimate away again as soon as Charon's winter pole emerges back into sunlight, except for one important detail: solar radiation modifies these ices to produce a new substance, which has a higher sublimation temperature and can't sublimate and then escape from Charon. This new substance is called a tholin, and has been made in similar conditions in laboratories here on Earth. The color of the tholin produced depends on the ratios of the different molecules and the amount and type of radiation you expose them to: tholins colored from yellow to red to black have been made this way. 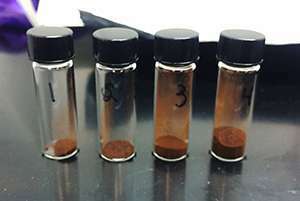 An example of this (pictured above) shows various red tholins made in a laboratory by Sarah Hörst at Johns Hopkins University. haron likely has gradually built up a polar deposit over millions of years as Pluto's atmosphere slowly escapes, during which time the surface is being irradiated by the sun. It appears the conditions on Charon are right to form red tholins similar to those shown, although we have yet to figure out exactly why. 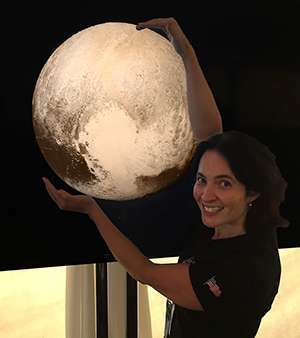 This is one of the many things I am looking forward to better understanding as we receive more New Horizons data over the next year and analyze it in conjunction with continued laboratory work. Quite unusual that no mention is given to the possibility of a magnetic field (even if historical) guiding charged particles into the poles. I'm confused about the temperature regime. So let's start with a solid state of gas on Pluto. It sublimates into gas and somehow achieves escape velocity and leaves the planet. When it reaches space (or outside Pluto's atmosphere) it is subject to the temperature there. Then it could be captured by Charon, spinning down to the pole and become subject to temperatures cool enough to convert it back to a solid stuck on the surface. Generally correct so far? If so, does this mean that the temperature in the space part of the journey is warmer than what is present at Charon's pole?